Montana has no shortage of lawyers — that's a fact. It's why Carmody Holliday Legal Services, PLLC, in Missoula works so hard for your business. We know you have a choice when it comes to legal services so everything we do — from real estate to business transactions and litigation — is aimed at gaining your trust and confidence. Our law firm was founded in 2001 by attorney Katherine C. Holliday. We have built a reputation for committed and passionate client service, and we are proud that many clients have been with us since we opened. They continue to recommend us personally to their family, friends and business associates. 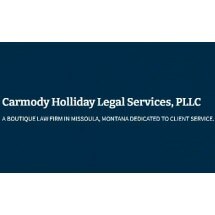 At Carmody Holliday Legal Services, PLLC, we also represent a wide range of local businesses and employers, including startups and well-known Montanan commercial enterprises, advising on contracts, business sales and other matters. For individuals and families, we offer discreet legal support on divorce, child custody and alimony as well as tailor-made advice on estate planning. We are not defined by our size — instead we seek to protect your legal interests in a way that is personal and relevant to your individual needs and priorities. Find out how we can help you or your business. Call us now. Payment by credit card is welcome.